Click here for recent News - Updated ! Welcome to the exciting and dynamic world of DePasquale Mixed Martial Arts! 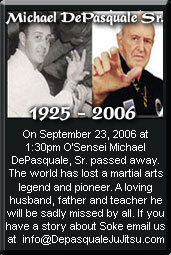 For almost half a century, the DePasquale name has been synonymous with excellence in the world of Martial Arts. Beginning with the late Michael DePasquale Sr. and continuing with his son, Michale DePasquale Jr.; all of the knowledge, tradition, discipline, and honor that make Martial Arts great are intact and flourishing. From the founding of the IFOJJ (The International Federation of Ju-Jutsuans • www.IFOJJ.com) by Michael DePasquale Sr., to the creation of FUMA (the Federation of United Martial Artists: Crusade Against Crime) a non-profit anti-crime organization started by Michael DePasquale Jr., who maintains a respectable presence in the Martial Arts Community. 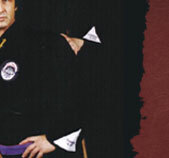 Both Michael DePasquale and his son have taught seminars the world over, competed and won in some of the biggest tournaments in the Martial Arts, are currently inductees in almost every major Martial Arts Hall of Fame or organization, and trained top Martial Artists. The legacy of Martial Arts began by Michael DePasquale and furthered by his son has extended the DePasquale name into several other related spheres: Michael DePasquale Jr. has starred in several Action/Martial Arts films, and even produced his own entitled "The Cutoff" www.TheCutoffMovie.com, is responsible for the 13 year run of "Karate International" magazine, holds a position as the chief proprietor of the explosive Action Film Academy www.ActionFilmAcademy.com, and is the head of one of the world's largest Martial Arts web sites, MAWN (the Martial Arts Worldwide Network • www.mawn.net). Michael DePasquale Jr. has also written several books on the subject of Martial Arts and Self Defense, published by Simon & Schuster and Tuttle, and is currently developing several Martial Arts related children's properties. If you are looking for a place to train with serious Martial Artists, a school to send your child where you feel confident they will learn the best that Martial Arts has to offer, or a dojo to find traditional seminar instructors with years of experience to hire for your school, then the DePasquale Mixed Martial Arts Academy is for you! MMA - Stand-up take-down to Grappling Submission classes starting now!